Have you ever thought about stretching your earlobes, but you just weren’t quite sure where to start? Here at Almost Famous Body Piercing we are always eager to help customers on their journey to beautiful stretched lobes! Before you begin stretching your earlobes, you need to wait until they are fully healed from the initial piercing. It is recommended to give your piercings 6 months to 1 year of healing time until you begin the stretching process! Once you are confident that your ear lobes are fully healed you can begin your first stretch. Typically, earlobes are pierced anywhere from a 20 gauge to an 8 gauge. The larger the number, the smaller the jewelry; additionally, the smaller the number of the gauge, the larger the jewelry. Here’s an example: a 16 gauge post is quite small, only about the thickness of a nail, but a 0 gauge is about the size of a pencil eraser. The gauge size measurements of jewelry usually go by twos – 20g, 18g, 16g, 14g, 12g, etc. To get to your desired gauge size, you need to start stretching your piercing slowly – only stretch one step at a time (18g to 16g and so on). To do that you can purchase what is called a taper. This is a stretching tool that is thinner on one end and larger on the other to get up to the next gauge size. At Almost Famous Body Piercing, we recommend purchasing the plug or tunnel with the taper set for the most comfortable stretch. The plug or tunnel will line up with the larger end of the taper allowing for a smooth transition! The taper is meant to be a stretching tool, not for everyday wear. If you are uncomfortable stretching your piercings on your own, we also offer stretching as a service! Make sure you are waiting a substantial amount of time in between stretches. We typically recommend a month or more in between each stretch depending on the size. This gives your piercing time to fully heal to the new size. Your piercing should be fully healed before the next stretch. No redness, no inflammation, no crust or drainage from your piercing. During the stretch, if your piercing starts to bleed, the skin around your piercing turns white in color, or it is extremely painful to continue, remove the taper or jewelry immediately. Your piercing is telling you that it is not ready for another stretch, or you are stretching too far. You will need to give the pierced area more time to heal before attempting to stretch again. Forcing a stretch could cause a blowout, or your skin can tear if you stretch too fast. A blowout is when the skin on the inside of the piercing is moving to the outside of the piercing, giving it a thick, unappealing appearance. This can happen on either the front or the back side of the ear lobe. Serious blowouts can only be repaired with surgery. A way to ease the stretching process is by using JoJoba Oil. JoJoba Oil is the liquid that comes from the seed of the Simmondsia chinensis plant – a shrub native to Arizona, California, and Mexico. At Almost Famous Body Piercing, we sell this oil to help stretch piercings. It is also a good oil to condition natural wood and horn jewelry. When the oil is applied and massaged into the skin around the piercing, it may increase the elasticity of the skin and eases the pushing of the taper through the piercing. Another useful tool for stretching is Stretch It! tape. Once you begin reaching the larger sizes or are simply struggling to use the taper to reach the next size, you can use the stretching tape to increase the size of your jewelry a millimeter or two at a time. The tape we sell at Almost Famous Body Piercing comes in a large roll and a large variety of fun colors! It is best to cut the tape into thin strips to fit all the way around your plug. Add one layer of tape around your plug every couple of days. This helps to slowly stretch your piercing as it slowly increases the overall diameter of the plug with each layer. Once you are at your desired size, whether it be a 8g or an inch, we offer a wide selection of plugs and tunnels you can rock! 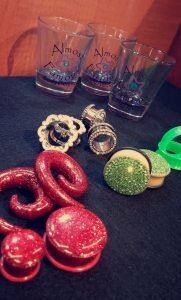 We carry titanium and steel tunnels, stone plugs and tunnels, as well as various acrylic, wood, silicone, steel, brass, and even glass styles. Our wood plugs have fun carvings like an owl, cat, or even an alien. The titanium and steel can be a very simplistic look, or you can add some flair to the metal tunnels with gems or other designs on the outside! You can even switch it up with the stone plugs if you want a more natural look. 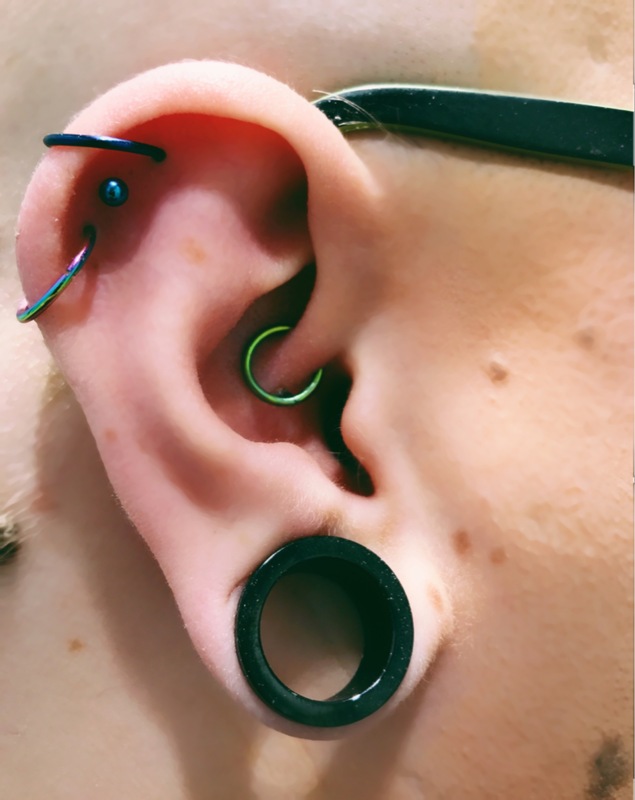 We also offer what are called hangers or plug hoops to really add some uniqueness to your stretched ear. These styles can look like normal, dangly earrings that fit nicely through a tunnel (or even just regular pierced ears) or they can be a gauged piece of jewelry with a design the spirals through the lobe. These have unique designs like a lightening bolt, an octopus, or even a tree. These can be a great way to dress up your look of stretched lobes!